Tonight I’m in my tent, with a lot of wet gear, and the rain is pouring outside. You can probably hear it in the recording. It was a rather interesting day. It started off sprinkling a bit; a thru passed me and said it was probably just falling off of the trees. And then it started really “falling off of the trees,” and did so the rest of the day. I did fourteen miles today, which included the bone-dry 11.8 mile stretch. And that was amusing, given all the rain which has been falling today. Given the rain, and the need to adjust my pack and my raingear anytime I need to adjust anything, I was on my feet virtually the entire 11.8 miles. There’s a really nice spring, informally named after Bink (aka Scott Williams), who has probably done the trail more times than anybody else. It’s off the beaten path, but there’s a loop trail which leads to the site. Good, fresh water, and easy to collect. I loaded up for the night, as tonight’s destination is a campsite with a “small seasonal spring.” And those are notoriously fickle right now. The proposed campsite was down to Road 52, and two miles up a reasonably steep ridge on the other side. So I hoisted my pack, put on my hood, and headed towards my campsite. But when I got to Tacoma Pass on Road 52, I discovered MAGIC! Oh my goodness, I was so excited I couldn’t even believe it! And I still can’t believe how incredibly, happy-dancing excited I was. There was a cooler full of Gatorades and Cokes, and another cooler full of beer, and some bananas and Cheez-Its. There is nothing like a bag of Cheez-Its. I never thought about that before. 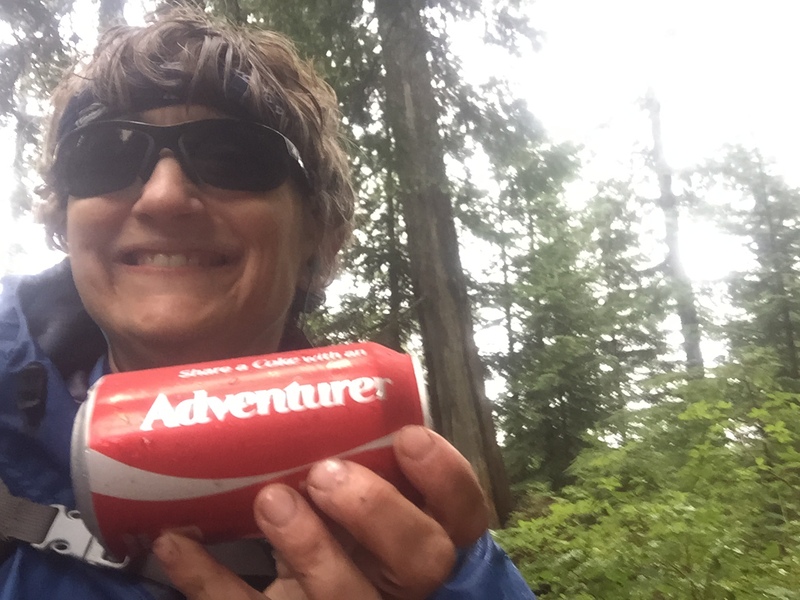 The really fun thing was that all the Cokes were of the “Share with a” variety, and I pulled “Adventurer.” That made me smile even more. And the purveyors of the magic? Pocahontas and her parents, whom I met above Crystal on the 12th! Given the rain, Pocahontas and her parents (who had a car) were heading downhill to get a hotel room, before returning to Tacoma Pass the next morning. It was all I could do to keep from pounding on the window and asking to go with them. After I’d met them, signed the register, and headed north, I reached my (rather damp) campsite. Just after pitching my tent, I met Daybreaker, who is a gentleman in his 70s. He was happily clad in a large green poncho, and waved as he continued up the hill. So I’m at my camp, tucked into my tent. Let’s just say that for the last 6-7 hours, it’s been pouring like a sumbitch. And it’s pouring harder now. Thank heavens the weather forecast predicts drier weather, as everything except my dry gear (bedding, sleep clothes, paperwork, etc., all double wrapped in a trash compactor bag) is mighty damp. Time to boil water and fill up my water bottles before I hit the rack. Last night, Murphy struck. Pretty much everything that could have gone wrong, did, with the exception of a large falling branch, which didn’t land on me. I didn’t get out of camp until 10:30 this morning. The plan was only ten miles today, which is where I’m at right now; this is the last spring before an 11.8 mile dry stretch, and it was best that I stage here tonight. So, Murphy. My shoes are starting to split across the toes, after only 100 miles with a moderate-weight pack. This is completely unacceptable from a trail persective, but Brooks Cascadia 10s are notorious for this kind of problem. Steve is going to bring up a new pair when he meets me at Snoqualmie in a few days. I’m going to try Tenacious Tape, and see if that helps hold them together for the next 50 miles. I don’t want to switch models, since these fit so well, and trying a new model of shoe on a long-distance hike could be problematic. 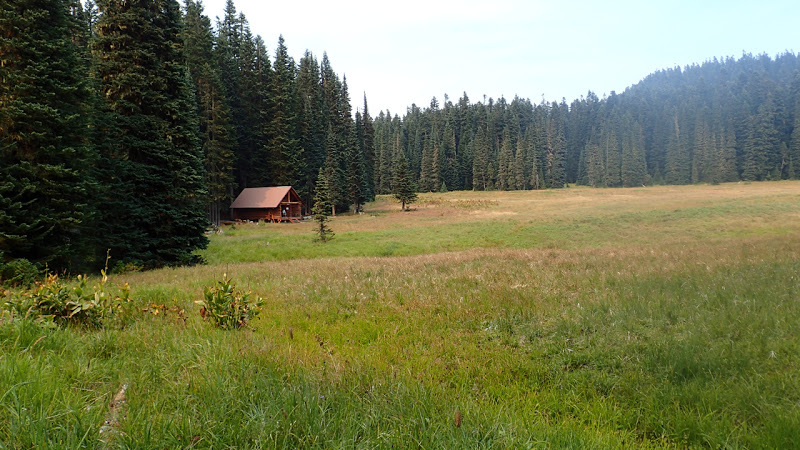 But the hike down to Mike Urich Cabin was easy, ending in a long run through flats down to Government Meadow…a lovely place. Anyway. Ten miles. Stopped at the cabin, which is owned by a local snowmobile club. It’s a really nice place, excellent for shelter during inclement weather. There was a bit of stale magic inside, but I wasn’t that desperate. I signed the register, and saw that Fuzzy Star had just been there (she’s the German girl I met at White Pass). Also saw ManBearPig’s entry; I know him from the FB group. There were some complaints in the register about people leaving trash, but the cabin was in fine shape when I got there. Oh, and there’s a Real Privy! So I sat on the porch, in the shade (sitting on a Real Bench is a delight), and had my lunch. I also met two girls who were going from Chinook to Snoqualmie, on their horses. They would pass me eventually, meet me at Mirror Lake, and then I saw them at the pass. After the cabin, it was five and small change miles to my campsite. There was a spot on the trail where you’re supposed to have an excellent view of Mt. Rainier. Or rather, you would. There’s enough smoke from the Cougar Creek fire, on the SSE side of Mt. 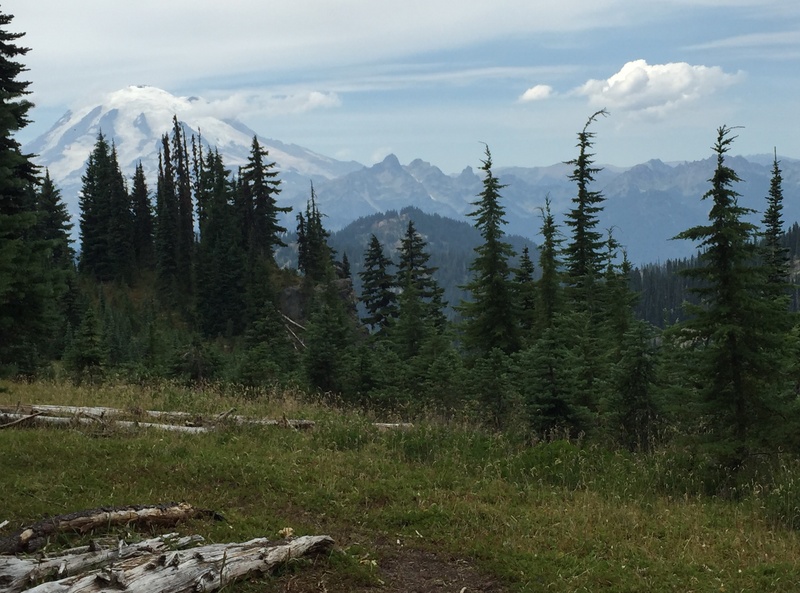 Adams, that all I could see at the view point was a small bit of Little Tahoma. Look very closely, and you can just see the bottom of Mt. Rainier through the smoke. A little further up the trail is the Falls Creek Burn. It’s really eerie, because it’s this entire bowl full of silvered, burned trees. Then if you look back up the trail, you could see the sun. Except the sun was red, from all the smoke. It was a fascinating composition, so I took a handful of pictures there. Anyway, I got to the campsite, and had camp set up in half an hour, which is a big improvement over earlier in the hike. Dinner was a bomb…nothing sounds good at all. So I’m drowning my sorrows in a cup of cocoa. I think my rather discouraged mood is partly because of lack of food. It’s not that I don’t have it, it’s that nothing is appealing. I messaged Steve and said that I’d like to have a true zero at Snoqualmie. I need to regroup a bit. Tomorrow, do the dry stretch, and see if I want to go further. Probably will, as it’s only 11.8 miles. Seventeen miles today. Not too bad for a person who was only supposed to do eight miles a week ago. I hit the trail at 7:15, and even with a long lunch I was in camp twelve hours later. But man, am I tired. I wasn’t sure I could do it, but I did, and that’s rather satisfying. 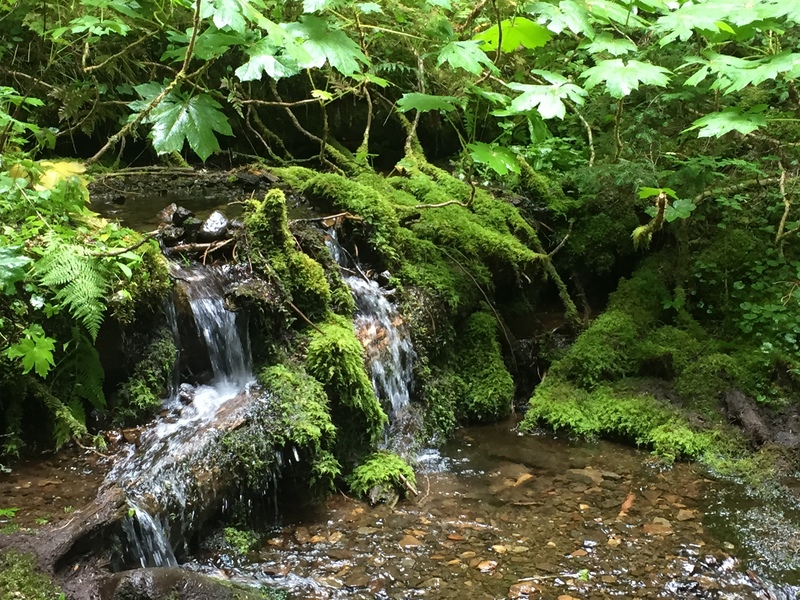 The reason for the large increase was that there are only a couple of places for water along this stretch of trail, with the first water at 8.5 miles. So I loaded up at Sheep Lake, and headed out, up toward Sourdough Gap. Climbing out of the bowl, in the early sunlight. 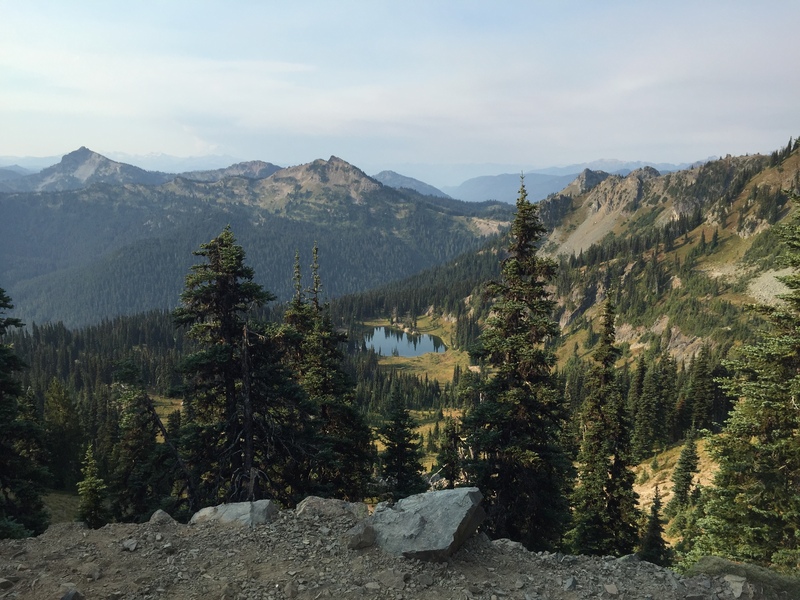 Next I traversed the ridges above Pickhandle Basin and the Silver Creek drainage. Due west of me was Crystal Mountain. I grew up skiing both at Crystal and the Snoqualmie Mountaineers. Crystal has changed quite a bit, of course, but I was able to pick out several of my favorite runs. And because I was above the resort, I had good signal! I got to talk with Steve and Patrick…a completely unexpected treat. Crystal Mountain. The upper left center peak is the top of the gondola; this was Chair 2 where I skied quite a bit. I also skied directly below in the opposite bowl. Lower right center, you can just see the base. I met more awesome people on the trail today, including a couple who were going to start in Campo in March, but the husband became ill and ended up in the hospital for two months. He made a full recovery, and now they’re out sectioning. I think that’s marvelous. I also met a couple above Crystal. The dad is an AT (Appalachian Trail) vet, and they were meeting their daughter Pocahontas, who is a thru. They were accompanying her for a supported hike from Crystal to Snoqualmie, and surprised her that day. How great is that? At 8.5 miles is a piped spring; it is unfortunately hidden from the trail itself, and so I went an extra half a mile before realizing my error and turning back. A piped spring is just that: a spring with a pipe sticking out to increase accessibility. This particular spring was flowing slowly, but by moving the pipe around I was able to collect enough water. I spent about half an hour at the spring, filling up, having my lunch, and chatting with sectioners (including a teacher from Sultan High School). From there, it was off to Arch Rock Spring, a little over seven more miles down the trail. By the time I got there, I was pretty tired, so I skipped the side trail to the spring. In theory, there were a small spring and campsite just down a steep part of the trail. The campsite was there, alright, but the creek had recently become a mere mud puddle. So it was time for a dry dinner, and then tomorrow I’ll head back up to the spring, and load up with water. I always study the map and the trail data before bed, and I’m going to see if I can sleep in a little later tomorrow. I only have ten miles tomorrow, as there’s an 11.8 mile dry stretch that I’d like to take first thing the following morning, when it’s cooler and I have fresh muscles. Peanut M&Ms for dinner tonight. 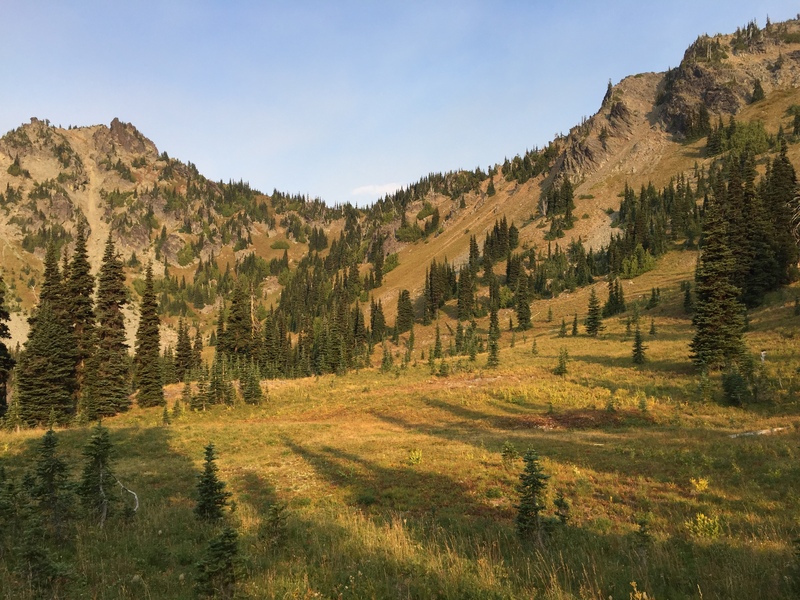 Tuesday, August 11, 2015, Mile 2323: Chinook Pass Magic! When I left camp this morning, I told the Fakarwiis that Brendan was going to be at the trailhead in a few hours, with some bagels. This was very welcome news, and they headed out not long after I did. 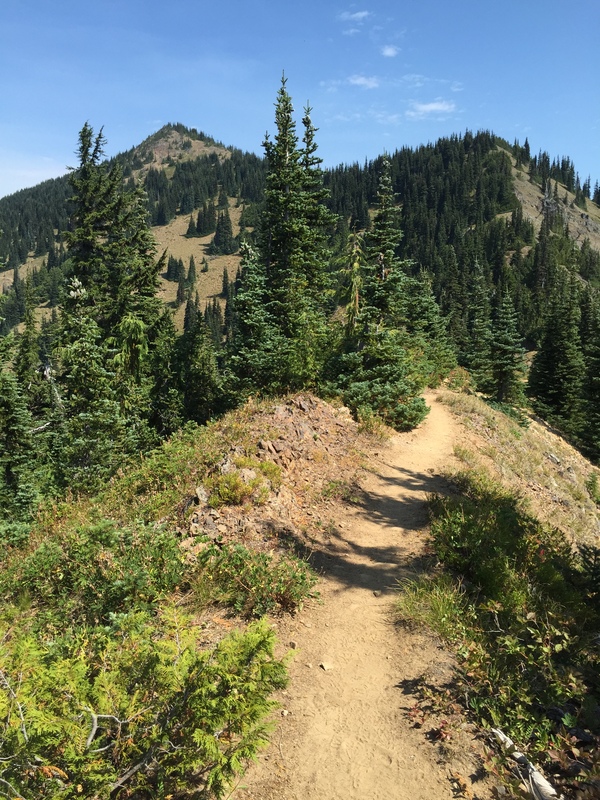 It was only three miles to Chinook Pass, over a lovely ridge and back down. …and down. This is where I started seeing day hikers. The closer I got to the pass, the more day hikers I saw. Some were out for a full day, and some were just taking a stroll out of the parking lot. For the first time, I noticed a phenomenon that other long distance hikers had mentioned. After several days on the trail, you just get used to the way your body naturally smells after a great deal of exercise. But as the day hikers approached, I could identify them strictly based on their smell: perfumes from deodorant, soap, shampoo, etc. It almost made my eyes water. 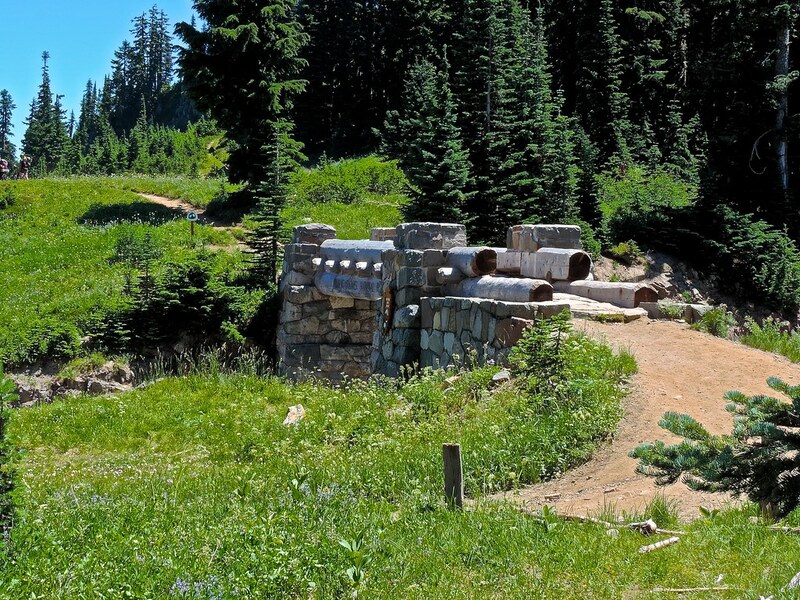 I got to the pass in good time, and crossed the beautiful log bridge over the highway. …and headed down into the parking lot. It’s fairly large, with a Real Privy and everything. I took some time to spread out my gear to dry. The Fakarwiis trickled in after me, and we hung out waiting for B. Well, he didn’t just show up with bagels. He showed up with Alex and Selena. 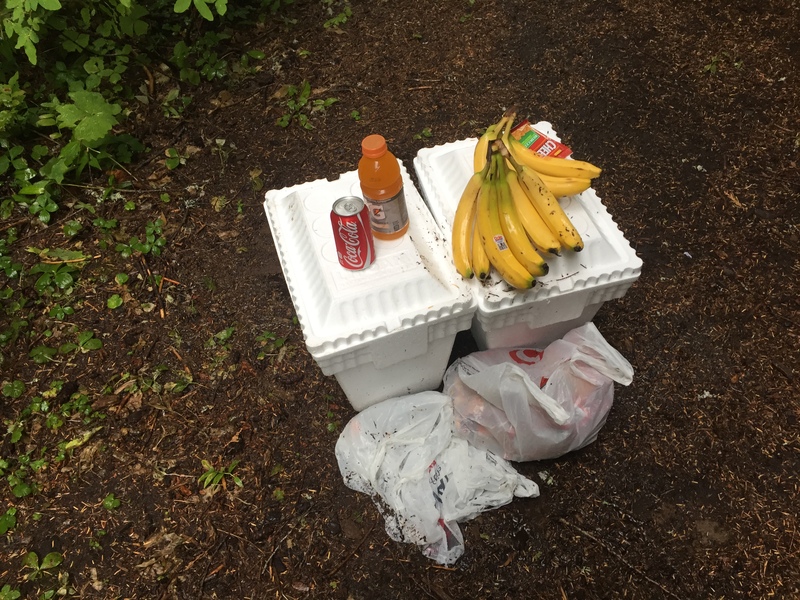 The three of them had stuffed the car with bagels, cream cheese, hiker tacos (tortillas, fresh cut veggies, shredded cheese, and bacon bits), cold soda, bottled water, extra ibuprofen, and hiker repair gear (duct tape, extra tent stakes, camp suds, etc.). They also brought a table, tablecloth, and lots of wipes for filthy hiker hands. Our eyes bugged out. The Fakarwiis dove headfirst into the chow. Pictured: B.L.T., Snickers, Fun Size, Windbreaker, Waypoint, and Brendan. The Fakarwiis and I jumped on that food like it was going out of style. Another hiker proclaimed it to be one of the two best pieces of trail magic he’d seen on the entire trail, which was a huge compliment. And Beowulf, a veteran of several long distance trails, actually did a happy dance. Brendan had thought that the hikers would be pleased…such a nice thing for him to do, etc. He absolutely couldn’t believe how grateful the hikers were. They were beside themselves. Anyway, he wants to do it again sometime. I’m very, very proud of the kiddos! Rest Step and her awesome son! Hiker check-in: the Fakarwiis , Beowulf, Bogey, Bambi Magnet (from Finland), and one other. I got my resupply, and it was very nice to be organizing my pack while sitting in a chair with a cold soda and my feet up. After hugs goodbye, the Fakarwiis headed north while I was resupplying. They are planning to do higher mileage than me, so unfortunately I doubt I’ll see them again. 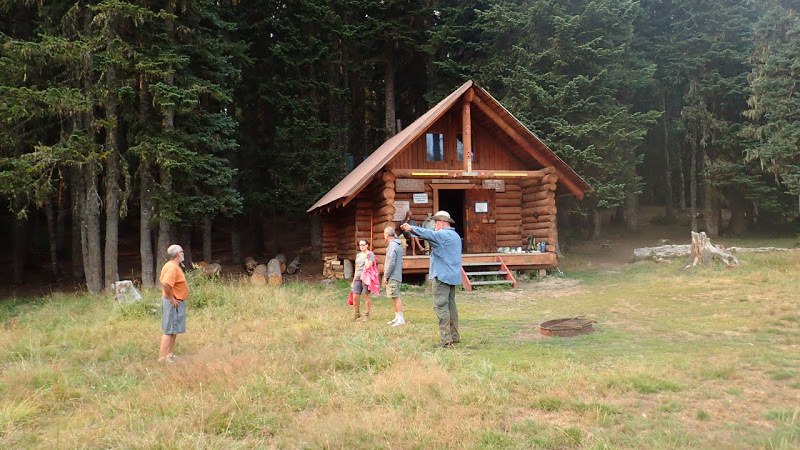 Once I was done, the kiddos took off, and I headed to Sheep Lake, just a few miles north. This evening I’m in a very big campsite, which could probably hold a small Scout troop. I grabbed a corner of it, in case other people needed a place. Right now the wind is howling, coming through the gap where the trail is; I hope it dies off after sunset. The lake is delightfully warm, and I took some time to really scrub out my hiking clothes and my socks (no soap, of course). I also got myself thoroughly rinsed off, which felt great. Sheep Lake, a pretty little place to spend the night. The only other party at the lake is a woman and her two elementary-age sons. They are out without her husband, for the first time. I met them as they were paddling across the lake on a log raft. We got to chatting, and it turns out that not only are they from Poulsbo, but her husband owns and operates a forge, where he does artisanal metal work. I’m passing on their names to the Ferrenbergs, as she said he’d love to meet Nicho. Their names are Renee and Elijah Burnett. It’s about 7:00, and I’ll probably call it a night, as I’m planning to get up earlier and do more miles (finally). Tomorrow’s goal is 16 miles. Footnote: The Fakarwiis headed north after the magic, and as I thought, we didn’t see each other again. They finished at Stevens a few days before I arrived. Waypoint messaged me after I got home, and offered to share his pictures…thank you! I’m sitting here doing the dishes as I record my entry. The day started with a smile. When I met Thermo yesterday, he gave me a hospitality gift of a little packet of Maxim coffee with cream. It was a really thoughtful gesture, and I thoroughly enjoyed it this morning. I’m looking forward to posting the picture of him and me on the Class of 2015 page. Ten miles today, and 2100 ft gain…better but still incredibly slow. I will be very glad to increase the mileage after Chinook Pass. This was the day I first crossed into Mt. Rainier National Park! After I hit the trail, I began climbing a ridge toward the boundary. Suddenly, there was the sign. It was a great feeling of accomplishment. 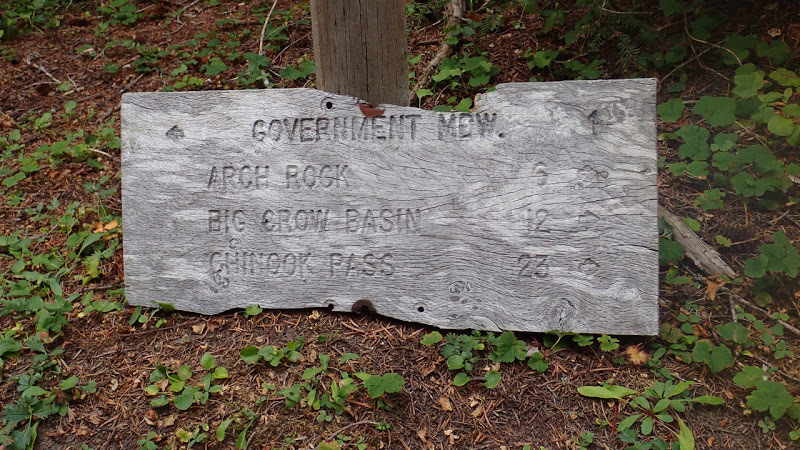 This was the first of a handful of signs, as the trail weaves in and out of the south and east sides of the park. And a few minutes later, this. I saw several of these high quality metal signs in the park. I met the Fakarwiis a couple of times today. Snickers, Fun Size, Waypoint, Windbreaker and B.L.T. had stopped for lunch at Two Lakes. 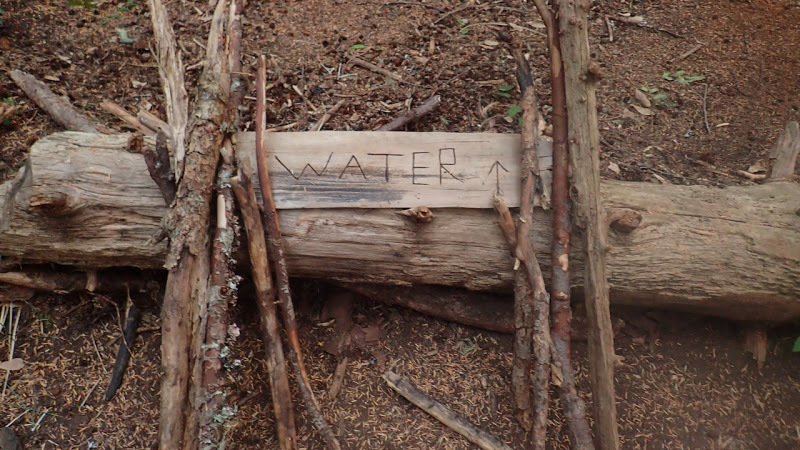 It was the only water source, so I also hoofed it ¼ miles of steep downhill on a side trail. And there they were! They invited me over for lunch, and we had a great time. Turns out three of them are former Scoutmasters, so there was an instant camaraderie. And when they were talking about their wives and girlfriends, I quipped, “To wives and sweethearts: may they never meet.” And one of them looked at me with an enormous, knowing grin. Aubrey-Maturin FTW. Shortly after lunch, I hit another boundary crossing. I’m not sure where I crossed out of the park, but it’s fairly easy to miss small signs meant for the southbound traffic. It gradually clouded up during the day, but I was able to see the Mountain. I love the ever-larger views. When I got to Dewey Lake, I met up with the Fakarwiis again. There are quite a few campsites, and I took one nearby but a bit off of the trail. Within about five minutes of my arrival, the thunderstorm which had been threatening, unloaded. It starting dumping everything, everywhere, right as I was beginning to set up the tent. Fortunately, there was a little grove of trees in one corner of my campsite, so I just set up the tent in there and walked it out. Which was good. Tent is dry, everybody is happy. I climbed in, inflated my pad, and set everything out. Time to relax. While I’m thinking about it, I’ll share a bit about the inside of my tent. My pad is a Big Agnes Q-Core SL, which I discovered this year. It’s the lightest weight insulated inflatable, at 17 oz and with an R value of 4.5. I retired my NeoAir, and have really appreciated the extra warmth this trip. I also use an Exped air pillow. Once my pack is empty, I put it under the foot of my pad, to elevate my feet and reduce swelling overnight. After my pad is set up, I attach my quilt. From there, I take out my current day’s food and my Ursack with the rest, and various ziplocs: first aid, toiletries, repair kit, and map pack, plus my clothes stuff sack. I also take out the must-stay-dry things, including my stash of unused maps and important papers, and my battery charger. My food goes outside the tent, of course, and at night it all goes into the Ursack before I secure it to a tree outside of camp. My hydration system also goes outside, except for my drinks bottle, which is filled with clean water and placed by the side of the tent for the night. I swap out maps at night when I’m planning next day’s route; I also plug in my electronics at night, and put them in the toe area of my quilt. It’s a lot of juggling, but I’m getting much faster…like many things, it’s just a routine. Anyway, once my camp was set up, and the rain had paused, I trotted down to the lake, only about a hundred feet away. I found a beautiful flat rock on which to scoop my water. And that water was incredibly clear…none of the silt you often find in a lake. I filled up absolutely everything, which is a 2L Platypus collapsible bladder, another Platy at 1L, and a 3/4 L Smartwater bottle, with filtered water to use for clean water and drinks. If it weren’t for the storms, I would have taken a dip. It rained and thundered on and off through the evening. It wasn’t huge, certainly not like mile 2200 in last year’s section, but it did keep rumbling in that vague Northwest fashion. I headed to bed early, to get up early for the hike into Chinook Pass, and had a dry dinner to save time. Looking forward to seeing B tomorrow! 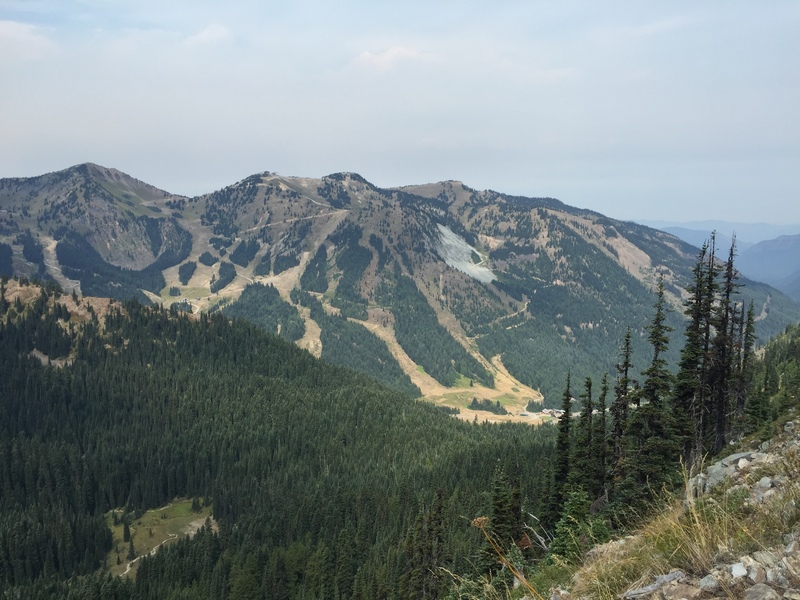 Footnote: The thunderstorms which were mild near Chinook Pass were stronger near Mt. Adams. Within 24 hours, smoke had reached north to our location, and the next day we learned that lightning had ignited the Cougar Creek Fire on Adams’ south side. This fire would eventually close the PCT in that area, necessitating a 23 mile road walk. The trail was reopened on September 8.